Is the loss of revenue due to inaccurate patient demographics a source of concern for your healthcare organization? Correct demographics in the charge entry process corroborate faster reimbursement and purports lesser claim denials. Generally, the patients fill in the demographic document which bears their personal & treatment details, family's medical history, etc. This helps physicians understand their patient's medical situation and recommend a certain course of action. Claim reimbursement and the amount of compensation depends on the accuracy of the charge entry. Outsourcing patient demographic entry services to a third-party service provider can assist you in successful claims processing and reduction in denials. Outsource2india is one such provider of patient demographic entry services in India who can successfully help you out with all your patient demographic entry requirements. At O2I, we make sure that we enter only 100% correct patient data. We do this by our multiple layers of cross-checking and verification process. Once you will hand over the patient data, our team of data entry experts will thoroughly check and validate the information. They will also review the supporting documents along with the patient's data. We ensure that all the data are updated and accurate before entering into the system. In case any document is missing or mismatching, we will do the follow-up and will get it rectified immediately. We receive the patient data via FTP/SFTP servers which are compressed, encrypted, and password protected. Thus, it provides the necessary security and saves the transmission time. If any document is missing or mismatching, we will follow up and will get it rectified immediately. Thereafter, our skilled data entry team enters the information into the medical billing software. We follow some of the most efficient patient demographics entry processes. With O2I, you have the liberty to choose the pricing model, which are based on hours, per unit work done, percentage collection, etc. We also customize our patient demographics entry services' pricing according to your niche needs. At Outsource2india, we have implemented meticulous privacy, security, and confidentiality safeguards at each level of our department. We have also set SOPs, regular training programs, and Quality Assurance (QA) inspections which help us offer the best quality services to you. We are ISO 9001:2000 certified organization and follow 100% HIPAA compliance standards, which ensure that all the required physical, network, and process security measures are in place and strictly followed. Our offices are equipped with the advanced infrastructure required to provide high-quality patient demographics entry services. We have Independent Internet Leased Circuits, built in IT redundancies, 200% power back up, HIPPA compliant office, certified medical coders, etc. We also direct our healthcare support executives and medical coding staff to strictly abide by HIPAA's security measures. We use the latest software like Medisoft, QRS, Medical Manager, Misys Tiger, Ortivus, Surgi Source, and MISYS. These web-based software support single sign-in, where you can submit insurance carrier requests. And to subdue the denials and improve the precision, we perform multispecialty charge entry leveraging our certified coders and the stated software. We assure you of accurate medical billing patient demographic entry within the deadline. Moreover, our global delivery centers that operate 24/7, give you a time zone advantage. We have a combined experience of 20 plus years in patient demographic entry services domain. Our health insurance experts surpass 200 in capacity, and our combined management experience exceeds 100+ man-years. Thus, when you outsource your requirements to us, you can be guaranteed to highly professional service. We have four different offices and five delivery centers across the globe. 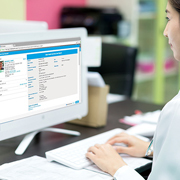 This allows us to be flexible and deliver error-free patient demographic entry services 24/7. You can be sure that our agent will be always available for calls during your work hours. We have the necessary resources, both in terms of expertise and infrastructure to provide error-free patient demographic entry services. You can depend on us to manage any surge in your business demands so that you pay only for the services rendered. We believe in providing individual attention to all our clients. That is why we deploy a dedicated medical billing expert to you who act as a one-point contact and provide their project undivided attention. O2I assisted a Georgia based client process close to 1000-1200 claims per month at an accuracy of 98%. We are very pleased with the work and attention to detail provided under our services agreement with O2I. We continue to look for ways to enhance this relationship with our billing company. Thank you again for all that you do. Outsource2india is a pioneer in providing highly accurate patient demographic entry services and a plethora of other medical billing and coding services. Having been catering to the healthcare services domain for almost 20 years now, we have the required skills and experience to cater to any of your needs. Our team includes some of the most talented and skilled medical data entry experts who are trained to provide highly accurate services. Our services can help your healthcare organization to reduce costs, improve cash flow, and increase their return on investment. We also provide Plastic Surgery Billing Services, ambulance billing services, EMS billing services, radiology medical billing services, and more. If you are looking for a reliable, accurate, efficient, and cost-effective patient demographic entry service provider, then look no further. Get in touch with us today!